The Times Union Center (formerly The Pepsi Arena) is a popular sports and entertainment complex located in downtown Albany. Patrons come from the Capital Region, much of Upstate New York, and nearby Vermont and Massachusetts. Home to local sports teams AHL Albany Devils and Siena Saints Men's Basketball team, The Times Union Center (formerly The Pepsi Arena) also boasts an impressive schedule of top performing artists, family shows, ice shows and special events such as trade shows. Concerts have included Billy Joel, U2, Elton John, Dixie Chicks, Britney Spears, Garth Brooks, Diddy, Celine Dion, The Dave Matthews Band, Phish, Bruce Springsteen, the Grateful Dead and many more. Some popular family shows have included Sesame Street Live, Disney on Ice, the Harlem Globetrotters, Nickelodeon's Live Tour and the Ringling Brothers Barnum & Bailey Circus. Tickets for all events can be purchased at The Times Union Center's box office or on their website and via Tickets.com (at their outlets, on their website, or through charge-by-phone). Seating charts can vary depending on the type of show and set up - the Arena's flexibility allows them to accommodate 6,000 to 17,000 seats so it's a good idea to check the Times Union Center seating chart before you purchase. The Arena opened in 1990 under its original name, the Knickerbocker Arena, and was christened by none other than the first performer, Frank Sinatra, on January 30, 1990. 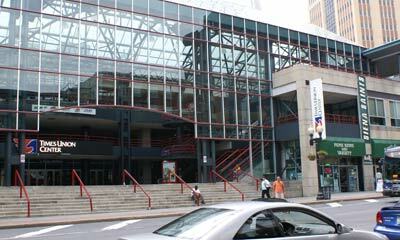 In 1997 it was renamed the Pepsi Arena, and ten years later it became the Times Union Center in January 2007. Through the years, the facility has consistently drawn top notch entertainment and sporting events, and nearly 7 million patrons have walked through its doors. Detailed directions as well as a map with parking areas can be found by clicking here.